With the snow relinquishing its hold on the hillsides, we have been spending much more time wandering through the woods. If I walk slowly enough, the woods will reveal creative opportunities in every direction. At my feet there is a pine cone that looks strangely different from the rest. To my right, a rock that sparkles in the sun. On the bank beside the path, a gnarled root that would make a great paperweight or bookend without any alterations whatsoever. On a recent trip two of our children carried half of their body weight in rocks home because they couldn’t bring themselves to leave such wonderful treasures behind. When they learned they wouldn’t be allowed to bring armloads of rocks inside, they quickly found creative outlets for them. For one a massive addition to her fairy garden, to another a great start for a decorative stone border for her strawberry patch. The burl on this tree will make a few beautiful bowls or one gorgeous bushel basket. What I love about these woodland art supplies is that as long as we manage the wilderness with gentle benevolent intent, there will always be more creative project prompts ready and waiting. I never go into the woods with an artistic purpose in mind. The things I see and find will guide the process organically. The balanced rocks in the feature photo took maybe 3 minutes of my time, but I get to watch their journey through the seasons for the rest of the year. I definitely didn’t expect that I would do that on that walk, but there was a pile of stones that was just waiting for rearranging. I don’t doubt that snow will knock them over this winter, but that will just give me a clean canvas for next year. “Many hands make light work.” I would argue that many small hands make light-hearted work. Children love to help, and often get giddy with excitement when there is an outdoor job to be done. Many times the job to be done couldn’t possibly accommodate as many workers as have volunteered, so I try to delegate down to the smallest task to involve as many willing helpers as possible. Usually this means the smallest children have completed their part of the job very quickly and move on to asking poignant and sometimes existential questions about the work we are doing, followed by spontaneous outbursts of energy which most times will culminate in a game of tag around the area where I continue to work. Like the phases of matter, solid to liquid to gas, these phases of children’s helpfulness are just part of the natural order of things. They heat up and cool down, settling back in to take a knee for a couple more questions before exploding outwards at full speed with no warning. If I were to time how long the job would take, I would not be surprised to learn that it took me far longer to complete the work with their help than without, but neither I nor they would have gotten nearly as much enjoyment out of it. Pausing to wipe sweat from my brow becomes a moment of joy, my sore back and aching feet forgotten as I watch the children squealing with joy when a hand just misses its mark or a ball goes flying over a head. They are helping me dig this hole just as much as if they held the shovel themselves. The day that bare root trees arrive in the mail is always an exciting day. It’s a day for dreaming, even for those of us who are usually so well grounded in reality. These finger-thick twigs with a few roots at their bottom will explode into a 12 foot tall solar-powered fruit factory in 5 years or less, and then continue bearing fruit loyally and faithfully for decades upon decades as long as you remember to uphold your part of the contract. Compost is the breakdown product of organic wastes, containing large proportions of humus which is a long-acting soil fertility booster. 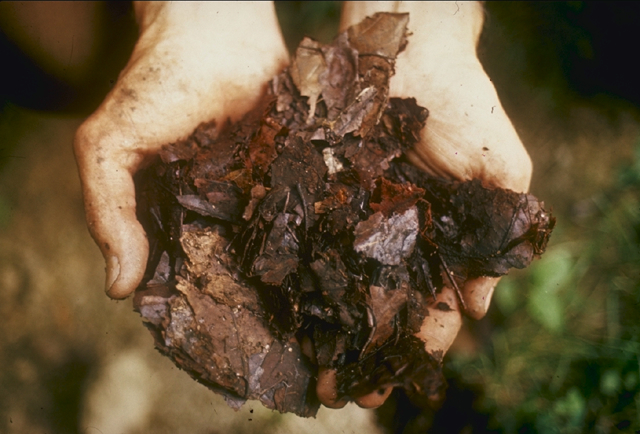 Any organic material (not talking about certified organic designation, just the carbon-based once-living kind of organic) can be composted, eventually becoming soil again as it once was before being integrated into an organism. 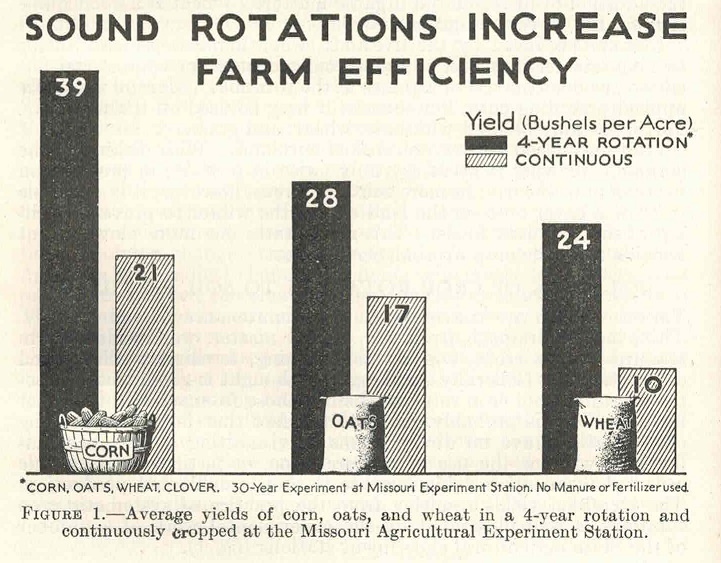 The concept of crop rotation is not a new idea. It is an idea as old as agriculture. Crop rotation, simply put, is growing a variety of plants in a planned manner to ensure that one species is not grown in the same field for multiple years in a row. It requires a certain amount of diversification, and on the larger industrial scale it can present problems in the need for many different equipment schemes for planting and harvesting. Modern agriculture ‘solves’ this dilemma by ‘scientifically’ replacing, in the form of fertilizer, what it considers to be all of the nutrients that the crop has removed from the soil in the previous year, and replanting that same crop. There are many problems with this plan that are not in the scope of this article to address. I find it interesting to read agricultural texts from different eras of our civilization. At the present moment I am increasing my collection of USDA Yearbooks of Agriculture, which I would recommend to anyone who is curious about agricultural techniques, policies, and studies. Particularly interesting to me are those books which were published during and directly following the Great Depression. In these years, agricultural science was making great leaps and bounds, not necessarily with new discoveries but with scientific proof that the practices of the preceding millennia were indeed spot-on, and that we should continue following our ancestors’ examples of land husbandry. Every farm must have water to function. There are many quite different solutions to this problem from the point of view of crop-raising, from overhead sprinklers to underground drip irrigation, from canal irrigation to raised beds, from biodynamic double digging to hugelkultur. Each of these methods has its own positives and negatives, more importantly they each have a particular environment in which they are the best choice for that space. In areas where there is a kind of rolling topography and a good proportion of clay in the soil, the farm pond shines due to its ease of engineering. 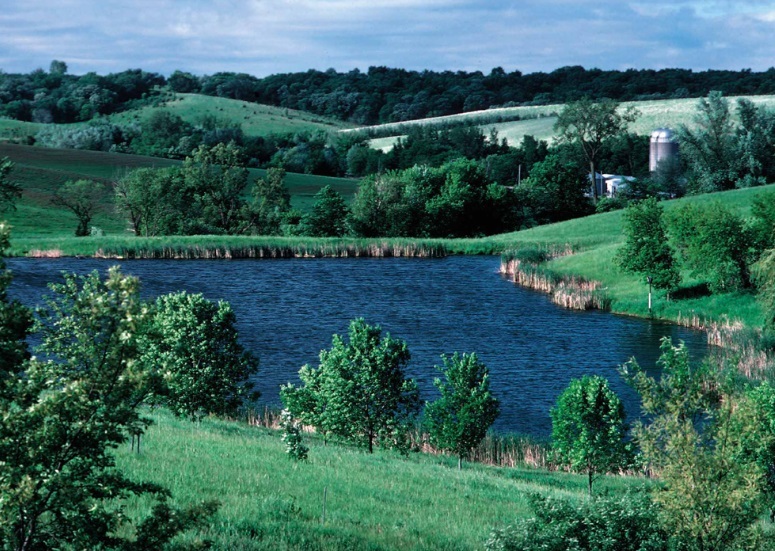 Where you have a watershed of two or more acres, you can build a sizable pond. It can be as simple (not easy: simple) as building a straight line dam from one rolling hill to the next. Enter your email address to be notified of my new posts. Every dollar counts. All donations are appreciated, and help me keep writing and growing. Thank you!